Each treatment takes minutes to complete! Did you know you can get five different beauty therapy treatments in one tool? With the Tua Spa facial toning machine you will achieve younger looking and feeling skin within minutes! Are you finding it a bit of a struggle trying to retrieve the younger skin you once had? You’ve tried it all; the cleansing brushes, exfoliators, the anti-aging creams and moisturisers but none of them seem to cut it. The cost of one beauty spa treatment is daylight robbery – just for a single treatment! But Tua Spa is different. They’ve designed a facial toning machine that utilises five different beauty spa treatments such as ultrasonic peeling and micro-current facial for you to achieve younger looking and feeling skin within minutes… and you can have as many treatments as you want! As we age, our skin produces less collagen and we begin to lose elastin’s flexibility (the substance that gives our skin its springy, young looking texture). We shed around 30,000 skin cells a minute; and as we age the cells do not shed as quickly from the skin’s surface which means that the turnover rate of new skin cells reproducing decreases and hydration levels drop. Unfortunately, the signs of aging begin to appear (boo!) - sometimes they begin to creep in at an early age of twenty (double-boo!). Dryness, discoloration and wrinkles begin to form as a result; our face and neck also begin to lose the youthful appearance as they lose contour and volume. Fine lines, imperfections and uneven texture – the list goes on when it comes to ageing skin! And all the while, you still get clogged pores and the occasional spots you thought you left behind in your teens. At least there’s some youth still there! 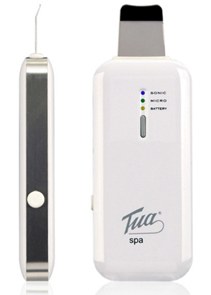 The Tua Spa facial toning machine combats all the signs of aging in one single beauty tool. The tool operates with two different technologies; ultrasonic waves and micro-currents. These two technologies are the advanced system for deep cleansing and anti-ageing for the face and neck and are used every day by spa specialists. Are you ready for the science behind this marvellous device? Let’s go! The Ultrasonic waves vibrate up to a magnificent 26,000 vibrations per second! The average ultrasonic sound waves vibrate above 20,000. These incredibly fast yet tiny waves generate waves alternating from high and low pressure in water to create ‘cavitation’. 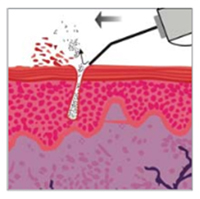 Cavitation is a recognised method of deep cleansing that is frequently used in clinical aesthetic practice. With your Tua Spa facial massager, the cavitation provides an incredibly effective deep cleanse into the pores, removing impurities through microscopic jets, suction and an action via gentle vibration peeling. 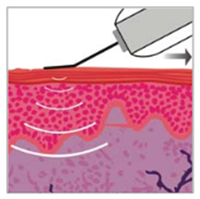 In a nutshell, an ultrasonic peeling! Micro-currents are special low voltage electronic mico-currents; the impulses given through the modulator alternate between positive and negative micro-currents up to a maximum of 500 micro-Amperes and you can choose from 3 intensity levels for your micro-current facial. The micro-current facial helps to boost circulation in a localised area of the skin and aids in stimulating the skin’s renewal process to improve tone and firmness. The facial will also encourage the regeneration of the tissues for younger looking, plump and firm skin. The absorption of facial creams and moisturisers will become more effective as the ultrasonic peeling and micro-current facial deeply cleanses the pores and the regeneration of new skin cells absorbs your creams easily. What are the five different treatments and what do they do? The Tua Spa has three performance modes that are incorporated with the two technologies to deliver five professional grade treatments: Sonic, Micro and Sonic+Micro. The ultrasonic waves are used to remove dirt and impurities from the surface of your skin; it gently hydro washes the skin’s pores using microscopic pressure jets. This treatment generates a mild heat which has antibacterial benefits such as reducing acne. The high intensity of ultrasonic waves removes dead skin cells, make-up that hasn’t been washed off properly, excess sebum and other debris from the skin’s surface. It is a gentle vibration peeling of the upper layer of the skin. By removing these impurities, hydration is improved and the new, fresh surface of the skin is more receptive to water and your favourite moisturising products, so you can have refined, healthy and nourished skin. Oily, dry patches and other imperfections will be reduced immediately so you can feel fresh faced. This treatment massages the skin so it can absorb in deeply your favourite facial moisturisers, oils and serums. Your skin’s hydration will instantly be improved and boost the local circulation so your skin is plump and radiant. The micro-current facial produces hydro-electronic micro-currents that are gentle and safe; these stimulate blood circulation and cellar metabolism to the skin; promoting fresh blood to reach the deeper layers of the skin and carries oxygen and nutrients to the skin. The micro-current waves that are gently produced help to activate the skin’s own renewal process such as the production of collagen and elastin (these are what give you that youthful, fresh, plump appearance by diminishing wrinkles and sagginess) and boost the rate of skin regeneration. Tua Spa micro-currents also help to tone the facial muscles by using electro muscular stimulation (EMS) that passes through the skins surface into the tissues for a deeper firming and toning effect. This treatment helps to reduce the appearance of fine lines and wrinkles by toning the face and leaving your complexion looking rejuvenated and glowing. Within three minutes, you will achieve plumped, radiant and youthful looking skin. This intensive facial uses both the Micro-massage Induction and Micro-current stimulation treatments. This treatment boosts blood circulation to the targeted area, stimulates cellular metabolism and moderately tones subcutaneous facial muscles; all the while, it allows your skin to absorb water and your favourite creams and moisturisers deeper into the skin. After three minutes, you will be, as Tua say “red carpet ready”. How do I use the Tua Spa Modulator? 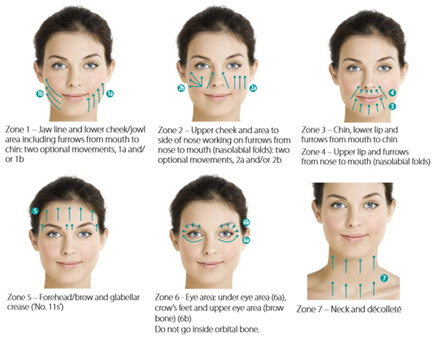 Place the modulator with the two tips facing down and touching your skin. You should use this position for the deep cleansing (treatment one) and exfoliation (treatment two) treatments; the gentle vibrations perform a deep cleansing and resurfacing ‘peeling’ action. You should apply light pressure onto the skin as you move the modulator forward, this will effectively unblock the pores and eliminate impurities. For this position, you use the flat side of the modulator against your face, gently. This position is used for the Micro-massage Induction (treatment three), Micro-current Stimulation (treatment four) and Skin Booster (treatment five) treatments to achieve smoother, plumper and rejuvenated skin. 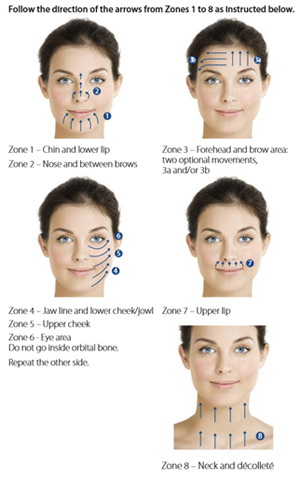 Like position one, you should apply sufficient pressure onto your face and gently as you move the modulator forward and lift the skin as you move the modulator upward on the face or neck. Be ready for any ‘red carpet’ event; the stars will be asking you what’s your secret!